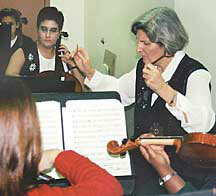 Carol Smith conducts members of the SHSU Symphony Orchestra in a rehearsal of Leopold Mozart's "Toy Symphony". An orchestral piece written by the father of the most prodigious of musical children will be performed by the Sam Houston State University Symphony Orchestra for Huntsville children and residents in the coming week. The orchestra will be busy beginning Saturday (Dec. 5)--with concerts for children on and off campuses, an evening carol sing-along, a courthouse gazebo concert, and a geriatric center visit. They will perform the Leopold Mozart "Toy Symphony," written by Wolfgang's father. The elder Mozart was a violinist and court composer, but not a musical genius as was his son. The "Toy Symphony" utilizes toy instruments including a toy trumpet, toy drum, quail, nightingale, triangle and rattle. Solo parts will also be played by Tajette Travenia and Leticia Carter (violin) and Tiffany Webb (cello). "Last year the Huntsville Arts Commission asked us to begin playing concerts in the schools again," said Carol Smith, SHSU orchestra conductor. "We have wanted to do that kind of thing but had not be able to for the last three years." Smith said that this year's effort will be on a "small scale," with two elementary schools this fall and return visits to the schools next spring. ""We will be talking about what it is like to attend a formal symphony concert, what the concertmistress does, the conductor, when to applaud, what the different instruments are and what the differences are in how they sound." The first of the children's format "information concerts" will not actually take place in a school, but at the First Methodist Church, from noon to 1 p.m. Saturday. Smith invites parents and students from the schools in which the orchestra will not perform, as well as downtown merchants and workers on lunch break, downtown shoppers, and anyone else who would like to attend, to do so. Admission is free. Saturday evening at 7:30 at First Methodist the orchestra will present a more formal concert, as well as a carol sing-along with the First Methodist Chancel Choir. Admission is free, but members of the audience are encouraged to bring non-perishable food items or make donations for food purchases for area charities. Then on Monday and Wednesday "information concerts" by the String Chamber Orchestra continue at Huntsville and Stewart elementary schools. On Tuesday, from noon to 1:50 p.m., the Chamber Orchestra will perform what Smith calls an "instrumental caroling" at the Fisher Tull Gazebo on the courthouse square. Holiday favorites such as "Hark the Herald Angels Sing," "Away in a Manger," "O Come all Ye Faithful," and others, are planned. "With the gazebo concert we're trying to offer the downtown merchants and visitors a bit of an 'impromptu' concert with favorite music of the season," said Smith. "We are, in a sense, going to them rather than asking them to come to us." The same approach holds true for Thursday's noon concert at the Ella Smither Geriatric Center. "Thanks to the Huntsville Arts Commission we'll be able to take some of our music to more of the residents of the community who might not be able to come to our regular concerts," said Smith.